My roommate in college, Serena, taught me how to make a moist banana cake studded with chocolate chips during our sophomore year in school. I still remember how I fell in love with it at first bite. And despite having a pastry chef for a sister, it was the only cake that I knew how to make for a long time. I enjoyed finding excuses to make it, and loved serving it to all my friends. When I was pregnant with my first baby, my mother paid me a surprise visit all the way from India. I wanted to make the cake for her. Mom’s baking skills were honed in my grandfather’s bread factory. She stood by and taught me how to beat soft butter and sugar together until it turned pale yellow for a fluffier cake. 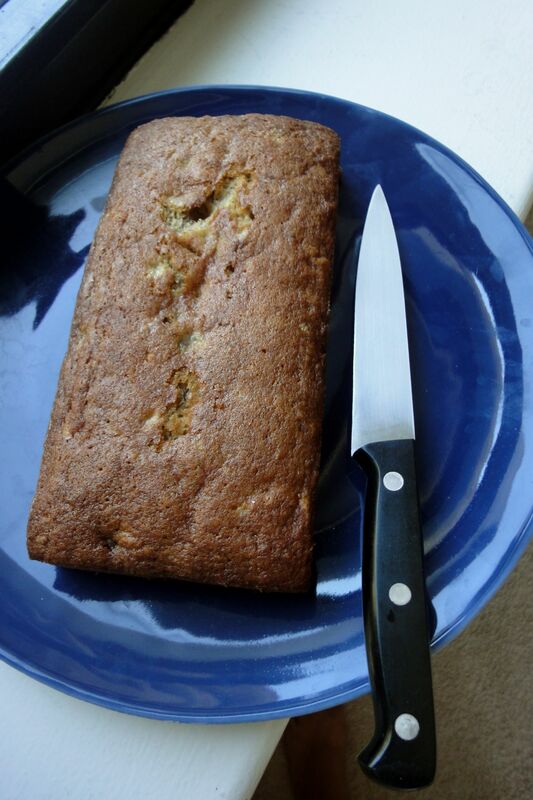 We discovered that over-ripe bananas added a wonderful, rich banana flavor to the cake. Mom also recommended adding a splash of vanilla extract to the cake to round out the flavors. I love this recipe for the simplicity of its ingredients and the easy measures. Add a half cup of chopped walnuts or pecans or a generous pinch of cinnamon and nutmeg for added texture and taste. This cake tastes particularly delicious with coconut ice-cream and also works well as a tea cake. 1. Pre-heat the oven to 350 degrees Fahrenheit. Butter and flour a 9x5x3-inch loaf pan. Tap out the excess flour. 2. Using an electric mixer on the lowest setting, beat the soft butter and sugar for several minutes until pale yellow and fluffy. Add the eggs one by one while the mixer is running. Add the mashed bananas and vanilla extract and mix well. 3. In a separate bowl, add the baking soda to the flour and mix with a whisk. Stir the flour mixture gently into the wet batter. Add the chocolate chips and stir. 4. Pour the dough into the prepared pan and bake about 30-45 minutes until a knife poked into the center of the cake comes out clean. Allow the cake to cool, run a knife along with inside of the pan and tap out the cake. If you like, dust with confectioner’s sugar to serve. Amazing!! some pics are really really tempting! The Egg plant varieties .. OMG!! so many 🙂 all yummy! Pics is a great idea. wonderful work !! hi to all at home!! I’m been reminiscing about the cake ever since I dived into it! Looking forward to trying my hand at it.. though I’m sure it won’t be half as good!